Kathie moved to Jacksonville in 2005 from Atlanta to be more active in her grandkid’s lives. She went to a few different churches with her family but never fully settled and she wanted to find a place to plug in. She was driving down Hodges when she saw the sign for Chets Creek Church. She thought Chets was a weird name for a church but her dad’s name was Chet so she figured she’d give it a try. After just one Sunday, Kathie said she knew Chets was the place for her. The following Sunday she found a LifeGroup and began getting involved. She was all in. Kathie heard about ESL during a Sunday service and it really interested her. She showed up on a Monday night to volunteer and she got put at the registration table. Her job was to be a friendly face and help check in students each week. A few weeks in, Chris Price came downstairs and said one of the teachers didn’t show up. He asked Kathie to teach. She said yes but she didn’t really want to do it. She didn’t feel equipped to teach. Once she got in the classroom, she found that she enjoyed engaging the students. She began sitting in classes as a volunteer. Linda Montgomery, who was the ESL ministry leader at the time, brought up teaching again with Kathie. Linda asked if she wanted to teach the advanced class. After sitting in on the class, she decided to give it a try. She got ESL certified and began teaching every week. She loved it! When Linda stepped down from the role of ministry leader, Abel Garcia asked Kathie if she would step into it. She wasn’t sure if that’s what she wanted but she had a good understanding of the program from serving in all the different roles. She prayed about it and took the position. Kathie has been leading the ESL ministry now for three years with Abel as a constant support through it all. Kathie said she prayed for God to double the ministry and He’s tripled it. “It’s fascinating to see how passionate and committed the teachers are. They want to be there, and they care about the students.” Last week they had 150 students and leaders. 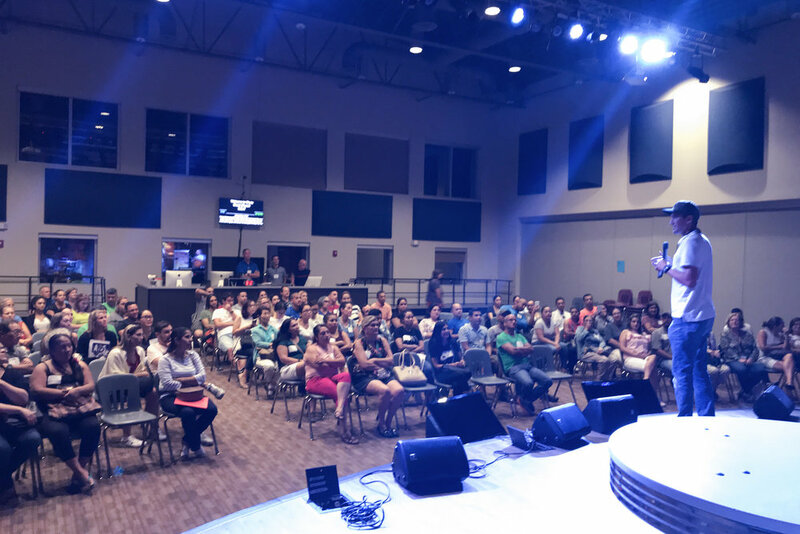 “I’ve learned so much through this ministry and I’ve seen God working incredibly through the students and the teachers.” Although ESL is about teaching conversational English, more importantly it’s about helping students learn about the love God has for them. The first night of ESL this fall they had someone place their faith in Christ. Kathie says it’s exciting to be a part of the growing ESL ministry at Chets.